Dr. Koen Verbist of UNESCO leads a discussion on “Enhancing Climate Services for Improved Water Management”, or CliMWaR. Photo credit: J. Olszewski, ICIWaRM. Dr. Jennifer Olszewski, an ICIWaRM-affiliated water resources engineer, participated and led group discussions on Climate Risk-Informed Decision Analysis (CRIDA) for water resources planning and management in a UNESCO-organized meeting on proactive drought risk management. The event was held in Santiago, Chile on 28 – 29 January 2019. The program of the meeting began with the formal release in Latin America of the LAC (Latin American and the Caribbean) Drought Atlas, which ICIWaRM has supported from its inception in 2006. This was followed by sessions on proactive drought risk management with case studies of climate impacts and adaptation responses in the region. Then, the UNESCO project “Enhancing Climate Services for Improved Water Management”, or CliMWaR, was introduced and launched. 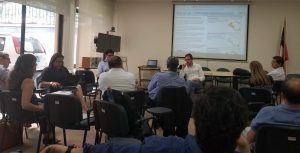 CliMWaR follows up on an early project on “Managing Water Resources in Arid and Semi-Arid Regions of Latin America and the Caribbean”, or MWAR-LAC. ICIWaRM-UNESCO report on “Climate Risk-Informed Decision Analysis”, or CRIDA. The first of four specific objectives of CliMWaR is to “Support the development of climate services for flood and drought management.” Embedded therein is the need for a framework for a bottom-up approach to include uncertain climate change information into decision-making. CRIDA, copublished in late 2018 by ICIWaRM and UNESCO’s International Hydrological Programme, is such a framework and has been successfully applied in SE Asia, South America, Southern Africa and the Great Lakes Region along the USA-Canada border. It is included as the third of four sub-objectives within Objective 1 of CliMWaR. There was an in-depth discussion of potential CRIDA application in the Elqui basin in Chile where there is a current modeling effort to characterize different stakeholder vulnerability to drought—especially with respect to a crucial aquifer fed by the basin. 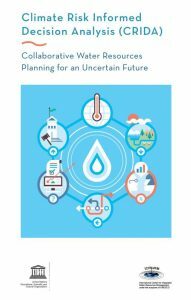 Dr. Olszewski, a representative of the UNESCO-affiliated Water Centre for Arid and Semi-Arid Zones in Latin America and the Caribbean (CAZALAC) and a hydrologist from RTI International generated a draft 3-year plan to implement such a planning process. ICIWaRM will review and see where action is appropriate.